Since early 2001 HotCandlestick.com has offered members a view through the window of candlestick chart analysis. Over 1,000,000 individual occurrences of candle patterns are identified on the daily charts of approximately 10,000 securities tracked by HotCandlestick.com. Members can quickly find patterns that have historically worked well for individual stocks and currencies. The candlestick pattern scoring system is a statistical analysis approach created by HotCandlestick.com to quantify the historical reward to risk ratio for individual stocks and currencies based on candlestick patterns. Stocks are prone to a variety of market forces, technical and fundamental. HotCandlestick.com developed a scoring system which accounts for variation in stock prices within and between stocks. The HotCandlestick SCORE measures the past success of a given candlestick pattern for a particular security. Criteria are set such that a stock must have at least 5 instances of a particular candlestick pattern before appearing in this database. The SCORE formula uses the standard deviation of the actual % gains for each of the 5 days following the candle signal. Scoring allows for easy identification of patterns that have worked well for individual stocks by ranking the % gains achieved based on how consistently those gains were achieved. HotCandlestick.com is a candlestick pattern identification data service, not an investment advisory service. Given that fact it is not possible to give out buy or sell recommendations of any kind. To find which LONG (BUY then SELL) positions worked well in the past you should look for high positive SCORE values. High positive SCORE values represents a historically high reward to risk ratio for LONG positions. Conversely, to find which SHORT (SELL then BUY) positions worked well in the past you should look for large negative SCORE values. Large negative SCORE values represents a high historical reward to risk ratio for SHORT positions. There is no maximum or minimum SCORE value. The SCORE is a mathematical way to quantify a historical reward to risk ratio. Since it is a ratio then interpretation can differ depending on the magnitudes of and variation inside the numerator and the denominator. For example, a stock with low median % gains and extremely low variation in those gains will likely have a relatively high SCORE. However, a stock with the same low variation in % gains but higher % gains will have a higher SCORE than the previous example. Yet another stock with higher variation in the % gains but magnitudes in the % gains greater than either of the previous examples may have a lower SCORE than both of the prior examples because of the penalty for high variation in the percent gains. Caution should be used when interpreting the SCORE values. 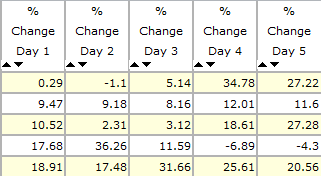 A higher positive SCORE value appears for a stock with the following historical 1st day percent gains (+5%, +4%, +7%, +8%, +3%) than another stock with the following historical 1st day % gains (-12%, +10%, +5%, +1%, +2%). The candlestick SCORE for the first example is 3250 and the second example is 84. Many other criteria are available to specify. Included in this database (1 of 3) are candlestick pattern, ticker symbol, candle strength, candle pattern count, median % changes for days 1-5, scores for days 1-5, overall 1-5 day score and many sorting options. First, it is important to understand how the daily percent changes are calculated. Day 1 values are based on the open and close prices the day after the pattern was identified. Day 5 values are based on the open price the day after the pattern was identified and the close price 4 days later. Any specific investment or investment service contained or referred to in this web site may not be suitable for all visitors to this site. An investment in stocks may mean investors may lose an amount even greater than their original investment. Anyone wishing to invest or speculate in the stock market should seek their own financial or professional advice. HotCandlestick.com, LLC is not an investment advisory service and does not recommend the purchase or sale of stocks. There are no licensed financial advisors working at HotCandlestick.com, LLC. HYPOTHETICAL PERFORMANCE RESULTS HAVE MANY INHERENT LIMITATIONS, SOME OF WHICH ARE DESCRIBED BELOW. NO REPRESENTATION IS BEING MADE THAT ANY ACCOUNT WILL OR IS LIKELY TO ACHIEVE PROFITS OR LOSSES SIMILAR TO THOSE SHOWN. IN FACT, THERE ARE FREQUENTLY SHARP DIFFERENCES BETWEEN HYPOTHETICAL PERFORMANCE RESULTS AND THE ACTUAL RESULTS SUBSEQUENTLY ACHIEVED BY ANY PARTICULAR TRADING SYSTEM. ONE OF THE LIMITATIONS OF HYPOTHETICAL PERFORMANCE RESULTS IS THAT THEY ARE GENERALLY PREPARED WITH THE BENEFIT OF HINDSIGHT. IN ADDITION, HYPOTHETICAL TRADING DOES NOT INVOLVE FINANCIAL RISK, AND NO HYPOTHETICAL TRADING RECORD CAN COMPLETELY ACCOUNT FOR THE IMPACT OF FINANCIAL RISK IN ACTUAL TRADING. FOR EXAMPLE, THE ABILITY TO WITHSTAND LOSSES OR TO ADHERE TO A PARTICULAR TRADING PROGRAM IN SPITE OF TRADING LOSSES ARE MATERIAL POINTS WHICH CAN ALSO ADVERSELY AFFECT ACTUAL TRADING RESULTS. THERE ARE NUMEROUS OTHER FACTORS RELATED TO THE MARKETS IN GENERAL OR TO THE IMPLEMENTATION OF ANY SPECIFIC TRADING PROGRAM WHICH CANNOT BE FULLY ACCOUNTED FOR IN THE PREPARATION OF HYPOTHETICAL PERFORMANCE RESULTS AND ALL OF WHICH CAN ADVERSELY AFFECT ACTUAL TRADING RESULTS. THE RISK OF LOSS IN TRADING STOCKS CAN BE SUBSTANTIAL. Stock trading is speculative and a substantial risk of loss exists. Past performance is not necessarily indicative of future results.